I think I need to be a more open person. I’ve always tended toward keeping my thoughts and problems and worries to myself. I mean, sure, I have a blog, but when do I ever write about my innermost fears and feelings? All of this is very ironic since I’m a strong advocate of openness in software and government and other things. I’m just not very open about my own life. Three Degrees of Josh: How much I trust people determines what treatment they get. I made the cheesy graphic all by myself! I almost never talk about Mom’s suicide, or about my shorter-than-usual mission experience. It’s all rather silly, given the amazing family and friends I have who would be thrilled to support me should I ever give them the chance. Surely this also deprives others struggling in similar ways (especially the pizza-deprived, who need as much support as they can get) from the realization that they’re not alone in their frustrations. I wonder how I can open up and stop acting like I have to hide my past and my present, at the expense of my future. This entry was posted in my life, on the mind on June 9, 2009 by Josh Hansen. So, I have a couple of comments. First of all, I think that both the “real reasons” you have, and the desire to cover up those real reasons, are very common. I experience some of them regularly. And I rarely tell people about them. Secondly, despite my own tendency to hide these parts of myself, I feel like they are opportunities to learn and grow, spiritually, emotionally, and socially. One of the best FHE lessons that I’ve had in a while was a discussion prompted by the “doubt trap” of a friend of mine. I think that we have to have the goal of turning these stumbling blocks into stepping stones. The really important thing though is that, aside from my “logical” things I had to say about your post, I think you’re a great person, and I’m glad to hear some of the inner thoughts and feelings of this great person I know! I wouldn’t be following this blog if I wasn’t. Thanks for posting, Josh. It takes guts (and humility) to spill your guts. 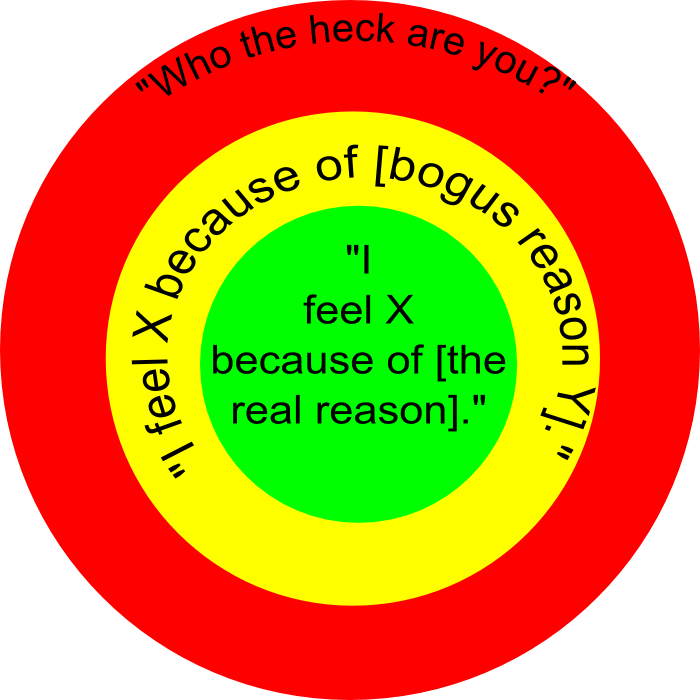 All of those green circle reasons just mean you’re human—a human who is learning and growing and struggling, just like all of us other humans. I think you’re a really cool person—even more now. Josh, you’re the best. I’m glad we’re friends. And I’m glad you would include me in the inner-most circle of openness and friendship. And I miss poetry club which is really truly actually “we are huge fans of Josh club”.